I’ve made a promise to myself that I’d never use the phrase in my own work, and to this day, I’m generally confident that I haven’t slipped. I won’t break the trend here, either, but the majority of this piece is centered around measurements of collegiate and professional basketball players from the 2017-18 season. The average 2017-18 NBA player is 79.07 inches tall (six feet, 7.06 inches) and weighs 218.73 pounds. The average 2017-18 NCAA D-I player is 77.02 inches tall (six feet, 5.02 inches) and weighs 202.21 pounds. That’s a difference of 2.04 inches and 16.52 pounds. I found the average height and weight of each NBA team and 336 of 351 D-I NCAA teams (15 teams did not have updated rosters for 2017-18). The complete graph of these averages (with weight on the x-axis and height on the y-axis) is below. The separation between NBA and NCAA average roster sizes isn’t nearly as large as I originally imagined. There are even a number of NCAA teams, such as Baylor, Penn State, and Duke, that size up fairly well with the NBA’s smaller rosters. Saint Peter’s and St. Francis (PA), however, are about two inches shorter and 20-30 pounds lighter than the average NBA roster. 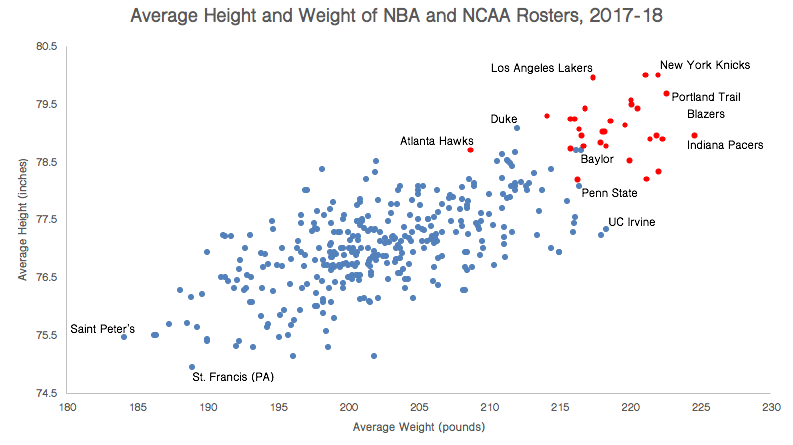 It should be noted that a number of NCAA teams are similar in average height as some of the shorter NBA rosters, but even so, the majority lag far behind in the weight category. The idea that college players need to “bulk up” when they make it to the pros seems very accurate. Interestingly enough, 12 of the 17 tallest players in D-I college basketball this season were not born in the United States. All 12 players are natives of different countries. UCF’s Tacko Fall and Florida State’s Christ Koumadje are both taller than every single NBA player in the 2017-18 NBA season. Ever since Yao Ming’s retirement in 2011 (he was 7-6), the NBA has lacked a jaw-dropping giant. I was curious to see the distribution of heights between both leagues to understand where the NBA has the two-inch advantage. If the tallest two college players are larger than any and all NBA players, but the average NBA player is still two inches taller, there must be a significant amount of near-seven footers. The table below shows the percentage of the respective league’s players that fall into a certain height category. Percentage is indicated by the y-axis. The NCAA has six times the amount of players that are under six feet tall, and almost double the players that are between 6-0 and 6-3. But then the NBA size takes over, with 38.79% of the NBA player universe coming from players that are between 6-8 to 6-11, and players over seven feet tall makes up nearly 10% of the league. The difference between tallest and shortest player in the NCAA is far greater than the NBA, obviously. UCF’s junior center Tacko Fall stands 7-6/295 while Florida Gulf Coast freshman Darnell Rogers is 5-3/150. That’s a remarkable difference of two feet and three inches and almost 150 pounds. Despite both schools residing in the Sunshine State, these two aren’t scheduled to battle in the regular season. Root for a UCF/Florida Gulf Coast duel in March, though, as it could result in one of the greatest sports photographs of all time. Over in the Association, Detroit’s Boban Marjanovic and New York’s Kristaps Porzingis stand at 7-3 while Cleveland star Isaiah Thomas is 5-9. The 18-inch differential is respectable, but not nearly as significant as Fall and Rogers’ gap of 27 inches. So when you hear arguments in mid-January about an undefeated college team being able to beat the NBA’s cellar dwellers, just know that it wouldn’t come without a lot of luck. Especially if you’re Saint Peter’s. Previous Post Is N.I.T. Momentum Real?